This article provides a discussion as well as recommendations for water-resistant sunscreen usage when swimming outside. To give you a bit about my perspective, until recently I didn’t think that using sunscreen when swimming outside was common. You see, here in Belgium, we have a temperate maritime climate where it rains a lot and temperatures are too low to swim outside most of the year. July and August are pretty much the only months where you can swim outside without using a swimsuit. Furthermore, the few outdoor pools we have are more often used for recreational activities rather than for swimming. So I only swim outside a few times per year in the summer, in a nearby lake, and I use a swimsuit anyway for the additional buoyancy and safety. So I thought that using sunscreen while swimming outside made little sense. But a discussion on Reddit prompted me to investigate the topic a bit more. First, I believed that water blocks UV rays. However, after a bit of research, I was quite surprised to learn that water transmits UV rays much better than I thought. In clean water, at one-meter depth (about three feet), water still transmits about 90% of the surface UV radiation. So it seems that using sunscreen while swimming outside does, in fact, make sense. 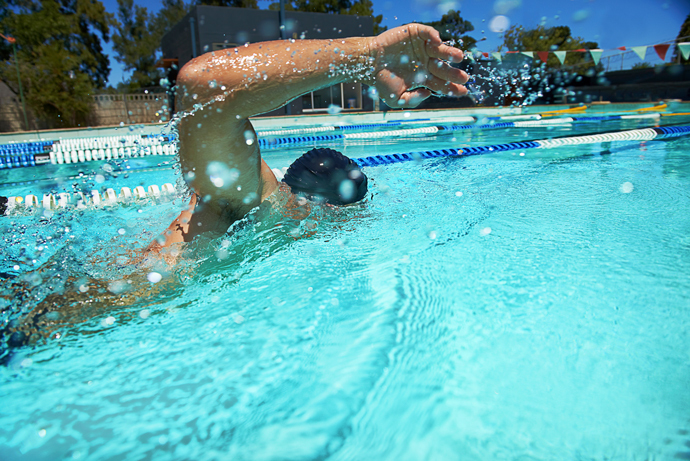 Another factor to take into account is that while swimming outside, your arms, head, shoulders, and back will repeatedly cut the water surface and be exposed directly to the sun. The water surface also reflects the UV rays, leading to increased exposure. That’s why open water swimmers can get badly burned backs if they swim long distances and don’t properly protect their skin. So this is another argument for using sunscreen. But the next question is, which sunscreen is recommended for outside swimmers? The first concept we need to understand is the sun protection factor (SPF) of sunscreens. The sun protection factor is a number that gives you an idea about how much solar energy is filtered out by a sunscreen. The higher the number, the higher the filtering action. As a consequence, a sunscreen with a higher SPF allows you to stay longer in the sun than a sunscreen with a lower SPF. But the higher SPF number doesn’t tell you how much longer you can stay in the sun, as the skin type, time of the day, geographic location, etc. also play a role. 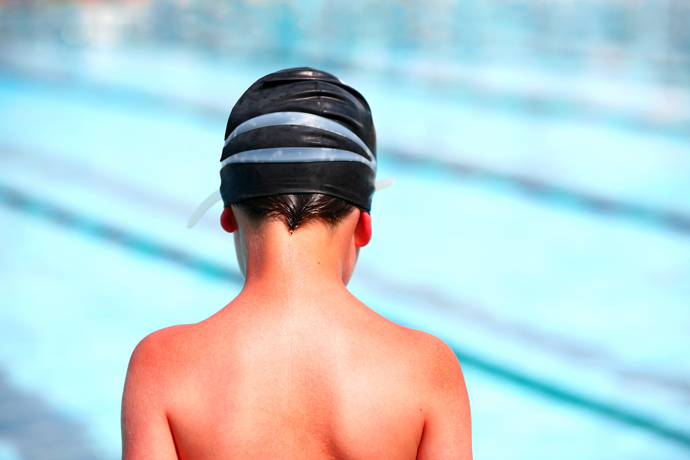 Sunscreens for swimmers typically have an SPF of 30 or higher. Another thing to understand about sunscreen labels are the terms water-resistant and waterproof. In the past, the use of the label waterproof on sunscreen packaging was allowed. However, this has changed in recent years. Nowadays, the FDA requires all sunscreens to be labeled as either water-resistant (40 minutes) or water-resistant (80 minutes) if they are intended for swimming or activities where you sweat a lot. The use of the term water-resistant instead of waterproof emphasizes the fact that over time, the sunscreen slowly dissolves in/with the water and, as a consequence, loses efficiency. The 40 minutes or 80 minutes period specifies for how long the sunscreen is effective before a new batch has to be reapplied. 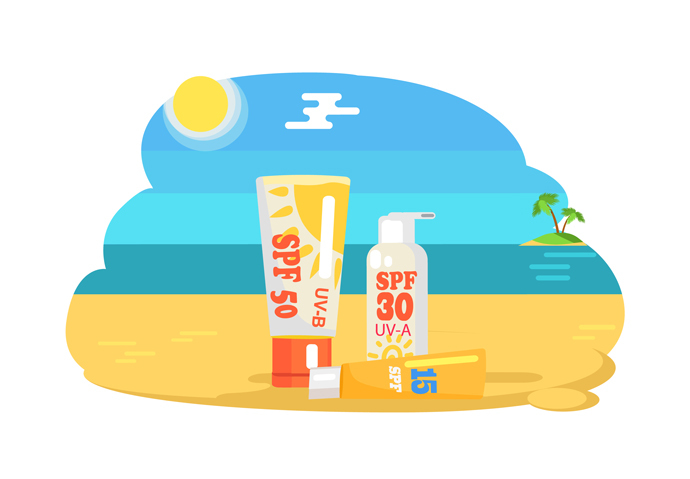 Based on the type of active UV-filtering ingredients used by a sunscreen, they can be classified into chemical sunscreens, mineral/physical sunscreens, and hybrid sunscreens. The filtering ingredients of chemical sunscreens are organic molecules with names such as avobenzone, oxybenzone, homosalate, etc. The term organic doesn’t relate to organic farming or production methods, but to the use of molecules that contain carbon atoms, as known from organic chemistry. The working principle of these chemical filters is that they absorb the UV radiation and convert it into heat before it reaches the skin. 1) They may mimic the action of hormones, disrupting your body’s hormones. 2) They can lead to skin allergies. 3) They can degrade if unused over long periods of time or if used in the sun. That’s why certain manufacturers add preservatives and sun-stabilizing ingredients to chemical sunscreens. 4) There’s also been some controversy recently with avobenzone, as a recent Russian study suggests that a common ingredient used in chemical sunscreens, avobenzone, breaks down into toxic or even cancerous substances when used in the sun in chlorinated water. At the moment, the jury is still out if this is a real or a theoretical issue, and more research is needed. Most dermatologists aware of the issue still consider the use of sunscreen containing avobenzone as safe. Another option might be to use a mineral-based sunscreen. 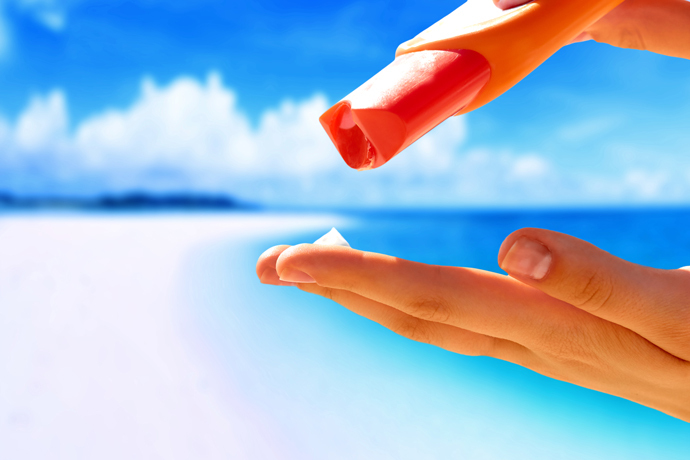 Mineral sunscreens (also called physical sunscreens) contain small zinc oxide or titanium dioxide particles. The working principle of these kinds of sunscreens is that they reflect the UV rays away from the skin. 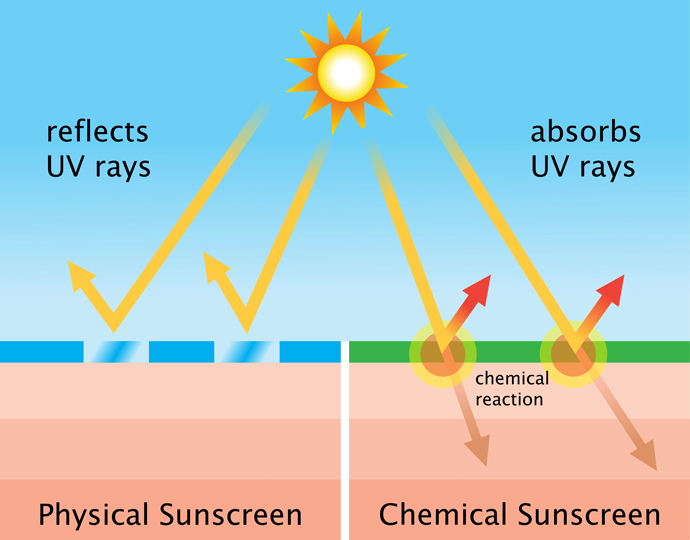 Mineral sunscreens block the UV rays well. They are also stable in the sun and don’t degrade over time. Zinc oxide blocks the full spectrum of UVA and UVB rays and as a consequence protects the skin very well when used in sunscreen. Zinc oxide has antibacterial properties and has been used to treat skin conditions for thousands of years. It is also used as an additive in many foods as a source of zinc. For these reasons, zinc oxide is relatively unproblematic as a sunscreen ingredient, unless you are allergic. Titanium dioxide blocks the full spectrum of UVB rays but only part of the UVA spectrum. So it is a bit less effective than Zinc oxide to protect your skin. Titanium dioxide isn’t absorbed through the skin. When inhaled, however, it is possibly carcinogenic to humans. However, this applies to titanium dioxide dust produced in industrial settings, and not to titanium dioxide contained in sunscreens. Allergies to titanium dioxide are also possible. Hybrid sunscreens are sunscreens that include both chemical and mineral filtering ingredients. Chemicals such as avobenzone and octinoxate are toxic for coral reefs, even in small quantities. Reef-friendly sunscreens, which are in fact mineral-based sunscreens, are thought to be less toxic to coral reefs. Usage of a reef-friendly sunscreen is mandatory in certain locations to protect local coral reefs. Ideally, you should apply sunscreen and let it dry for about 30 minutes before going into the water. Then reapply it again when leaving the water. Furthermore, the sunscreen only protects the skin for a limited time. 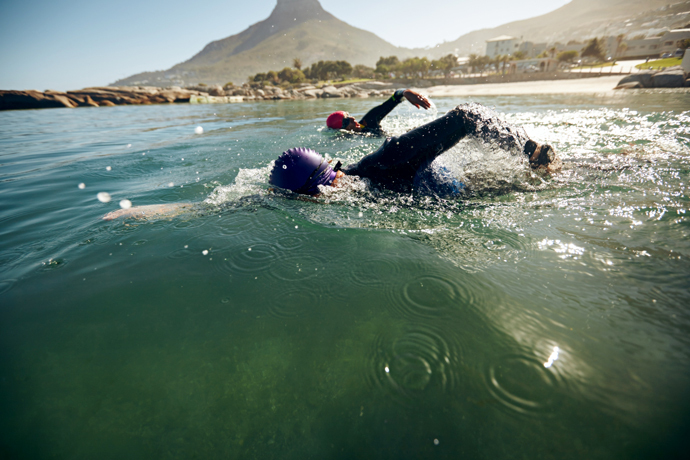 So if possible, limit the time you spend in the water, reapply sunscreen periodically, or maybe wear a swim shirt or wetsuit if you are going to be swimming longer distances. MarathonSwimmers.org have an interesting discussion about products and strategies you can use to protect your skin from the sun during long open-water swims. The aforementioned Reddit discussion is also an interesting read. Using a sunscreen definitely makes sense if you go swimming outside. So protect your skin accordingly, and stay safe.